Do your students need a quick reminder on following directions? 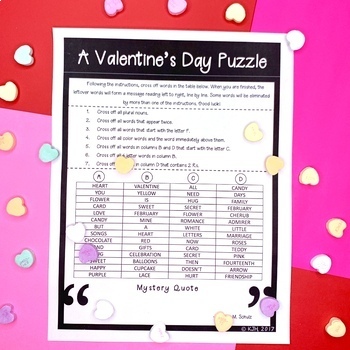 This ready-to-print Valentine's Day puzzle can only be completed with close attention to detail and working through step-by-step directions. Who can solve this sweet mystery? >>> This is 1 of 9 puzzles from the complete set. ⭐ You can find the entire Following Directions: A Puzzle a Month set here! Students eliminate words in a table by following directions carefully. Students will be left with words that form a mystery quote/ famous saying. 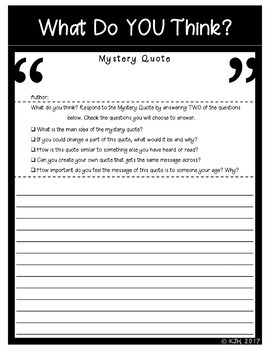 Give students the opportunity to reflect on the mystery quote by completing an optional journal page as a follow up activity to the puzzle. 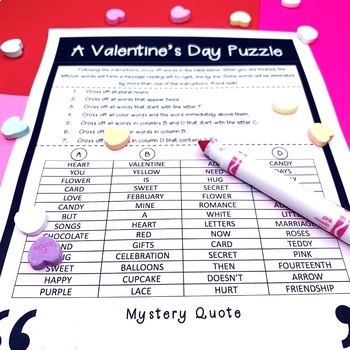 "I had so much fun using this page for Valentine's Day. It was an excellent wake-up call to my students on how they need to read much more carefully." 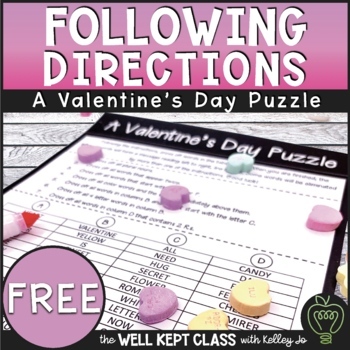 "Did this on Valentine's day, it was great practice in following directions for my 4/5 students." "What a great freebie ! I like how you including a writing component as well. This will be great for my early finishers. Thank you!" "This is fantastic! Can't wait to challenge my gifted 3rd graders!" "What a fun following directions activity! Will be using with several of my students in my individual tutoring lessons. Thank you for a great free resource!!" Remember to FOLLOW ME and be notified when new products are added to my store! Copyright © KJH. All rights reserved by author. This product is to be used by the original downloader only. Copying for more than one teacher, classroom, department, school, or school system is prohibited. This product may not be distributed or displayed for public view. Elements found in this PDF are copyrighted and cannot be extracted and used outside of this file without permission or license. Intended for classroom and personal use ONLY.